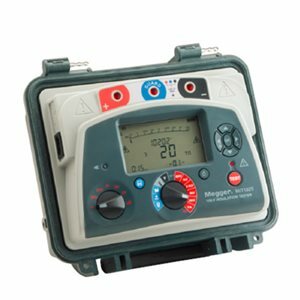 Offering CAT IV, the MIT1025 is compact, light 10 kV insulation resistance tester for the diagnostic testing and maintenance of high voltage electrical equipment. Enclosed in a tough case it is both smaller and lighter than its predecessor making it even easier to carry and store. As well as measuring insulation resitance to 20 TΩ, the MIT1025 also offers various diagnostic tests such as Polarisation index, Dielectric Absorption Ratio, Step Voltage, Dielectric discharge and ramp testing. Now equipped with lithium ion fast rechargeable batteries, the instrument has a large, clear, easy to read, display making it equally suitable for use in both bright sunlight and poorly lit environments. Information displayed includes resistance, voltage, leakage current, capacitance, battery status and time constant. In addition, the elapsed time of the test is displayed constantly removing the need for separate timer. Please download files as necessary for your equipment.